Service failed to start : An exception occurred in the service when handling the control request. This is what i get when trying to manually start the service. 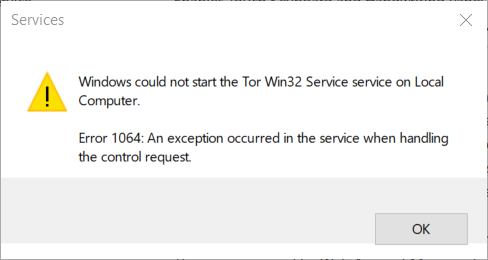 I tried the tor-win32 zip file from https://dist.torproject.org/torbrowser/7.5.1/ and the same error displayed again. Anyway when i run the command tor --service install the service is installed and started successfully. So i guess there is a problem with the torrc file. How to install Tor on Windows 7 for running a hidden service?